The information on this page is for EMS Safety Instructors who plan to teach the CPR/AED and Basic First Aid course for providers who need United States Coast Guard (USCG)-approved training. • As a component to be used to meet STCW’s Basic Safety Training requirement. • For the original issuance of an officer endorsement (such as a captain’s license). Everything you need to know about teaching the USCG-approved course is in the USCG Instructions. Images of your teaching facility. 2 or more photos of the classroom (must seat a minimum of 12 students and provide room for hands-on practice of skills). 1 drawing of the classroom measurements. Ensure this is set-up for training and include aisles, doors, and fire exits. The name, location, and list of Instructors teaching at this site. There is no instance where a completion card by itself can be issued to document successful completion of a USCG-Approved course. The card must be accompanied by an EMS Safety USCG Course Completion Certificate. Course Completion Certificates are ONLY ISSUED by EMS Safety. After the course, submit the required documents and course records to EMS Safety. EMS Safety will validate the course records and send the USCG Course Completion Certificates back to you for distribution to the students. The required documents and course records are listed in the USCG instructions. The fee for processing USCG Course Completion certificates is $3 per student. USCG Course completion certificates will not be processed without an existing USCG site approval or if any data is missing, incomplete or illegible. Have questions about teaching a USCG-approved CPR/AED and Basic First Aid course? We’re happy to help! Email your questions to approvals@emssafety.com. The student says he just ‘needs a card.’ Do we have to issue the USCG Course Completion Certificate every time? Yes. The only way to document the course is a USCG-approved CPR and First Aid training is with the course completion card and the USCG Course Completion Certificate. There are no exceptions. Can I create my own USCG Course Completion Certificate? No. The USCG requires EMS Safety to have a site approval on file and maintain course records for every USCG course. 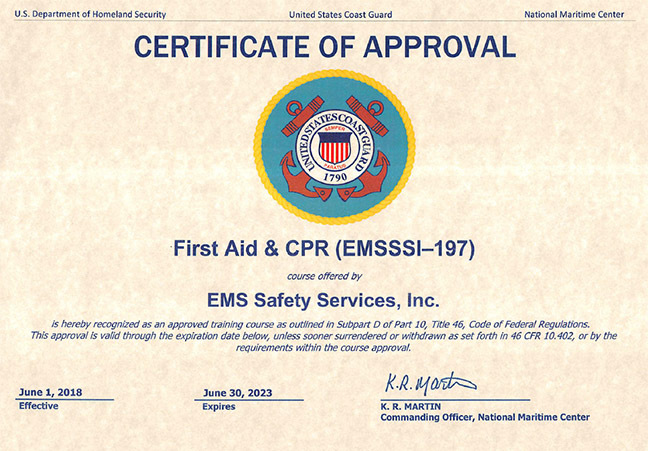 USCG Course Completion Certificates are only issued from EMS Safety to the Instructor. No. AED training is optional. At this time the USCG only requires CPR and Basic First Aid. However, EMS Safety requires AED training when an AED is part of the ship’s response protocol. How long does the course need to be? Is a written test required? Yes. The exam answer sheet is part of the USCG-required course documents.